and then, just for fun, added a little snowflake on the sign and star on the mitten! I used a MFT scalloped edge die for the bottom edge. Finally, I added some Silver Encore stars from the Jingle All the Way set. Lots of fun stuff going on here! I am also entering this in the Inkspirational challenge #95, which is any color plus silver! Cassidy and Dominic at a “make-your-own-pizza” place….not sure why Cassidy is smelling her dough, but it looks like fun anyway!! Enjoy your day! Oh my gosh!! those mittens look so warm and fuzzy, soon I will dig mine out, it's so cold up here already. Love your card LeAnne, that sign looks so vintage with the Hardwood stamp in the background and the fabulous bling of the glimmer papers. So cute -- love the dangling, felt mittens. It's hard to know where to start raving over this stunning card: the cutest little felt mittens, the subtle backgrounding with the hardwood stamp, the contrast of bling and rustic, the soft detailing of the silver stars on the panel, the repetition of the mitten motif - or just the outright wonderfulness of the whole thing! Thank you so much for joining us this week at As You See It. 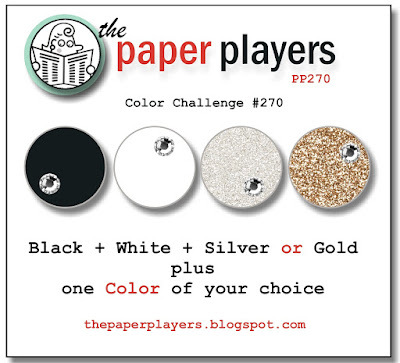 It was a nice surprise to be scrolling through the new challenge at Paper Players and recognising the sketch! Squeal!!! Those mittens are adorable LeAnne, such a sweet card!! Make your own pizza sounds fun, bet the kids loved it! I love this card. Those hanging mittens are adorable. I love the vintage sign too. Way to combine these challenges. I love the idea of a rustic sign for the sentiment! And the colours simply pop right off the page! But my favourite part is the little silver snowflake! Thanks for contributing to our gallery at As You See It Challenges this week! Oh my gosh, those little mittens are the cutest! What a sweet little card...so much homespun charm. Simply adorable! CUTE!!! I love the mittens! I noticed tons of cards at my local craft store made with felt die cuts. Love the texture..such a warm feeling! Oh my goodness - those little felt mittens are utterly adorable! Love the sentiment and layering too. A great time on my challenge this week LeAnne! Ohhhhh I LOVE this card!!!!! Has to be in my top 10 favorite for Christmas. That's just precious! I just adore everything about this card! From the cute lace effect you've achieved with die cuts, to the distressed sign, to the sweet mittens! Thanks so much for playing along with the As You See It Challenge this week! LeAnne is this just adorable! I love the colors, the little mittens, the layout.... it's all fabulous! That card is adorable! Fun looking party too. Oh this is stunning! I love all the layers and details. Very fun card! Thanks for joining us at Inspirational!